John Lyons spoke to Sylvia Cronin, Director of Insurance Supervision at the Central Bank of Ireland, about the changing regulatory environment, the challenges she faces in implementing Solvency II and the ways in which she is organising her resources ahead of changes later this year in the way the Irish insurance industry is supervised. 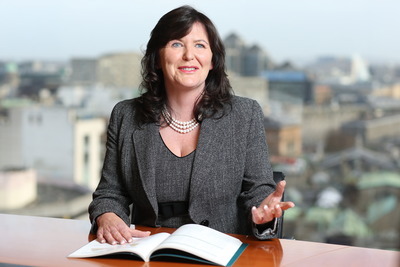 Sylvia Cronin joined the Central Bank last October as Director of Insurance Supervision, having previously worked exclusively in the private sector. It has been a tumultuous nine months with many issues arising in addition to the obvious pressure of steering the 15 year long Solvency II project through its critical implementation phase. I wondered how it might all have affected Ms Cronin, whom I had previously known as a relaxed and smiling lady. Talking to me in her Dublin office she admits the job involves long hours and that she has to take work home with her. On the other hand, she says, it has been more rewarding than she expected and she gets great satisfaction from the breadth of the work and the chance to serve the public interest. She is also motivated by the calibre of the people working with her and their collective readiness to embrace a changing regulatory environment whilst continuing to enhance standards of insurance supervision. Getting into the detail, Cronin explains that the way insurance companies are supervised needs to change and that this will happen later this year. She is reorganising her team into core supervisory and shared technical divisions, the latter including specialists such as data analytics experts and actuaries. The core supervisory section will in the future include an on-site team, who will spend time in the offices of insurance companies on themed inspections. This approach, which is already in place in banking supervision, will enable the Central Bank to see how effective companies’ stated policies are and how well embedded they are in their organisations. 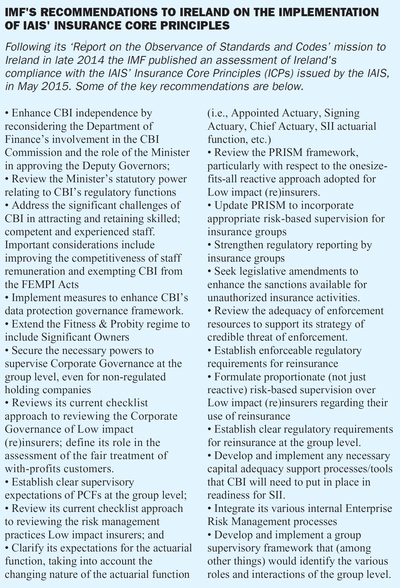 The themes for inspection will be signalled in advance and the companies selected for inspection will include low and medium low risk companies as well as the higher rated companies under the Prism system. This will help address one of the criticisms made in the recent IMF review that the supervisory approach to the low and medium low companies is at present too reactive. On another criticism of the IMF, namely that turnover of supervisory staff is too high, Cronin acknowledges difficulties experienced to date but points to progress made. While admitting that staffing is a key ongoing challenge, she says that there has been a big improvement since early 2014 when vacancy rates were as high as 40%. Now the situation has stabilised somewhat and they have over 90% of their complement of 114 currently in place. A major effort is going into training, especially to deal with the changes coming in with Solvency II at the end of this year. Adapting to Solvency II is a huge challenge for the Bank. For example, the current admissibility rules for investments will no longer apply and investments instead will have to satisfy the Prudent Person Principle. Staff will need to know how to question companies on the investments they hold. The approach that they are being trained to follow on this, as on other issues, will be one of “intrusive professional scepticism”. Companies can expect their explanations to be challenged where necessary. One development that should help the Bank improve its supervision in the post Solvency II world is the amount of data that it will have available and the use of modern data analytics to analyse it. This will enable it to do comparisons and spot trends and thus see any problems emerging much more effectively than at present. Cronin does not see the supervision of large companies moving to Europe as is happening with banks. Instead she sees the system of group supervision developing further where there is a lead supervisor and a “college” of national supervisors working together. This system is already in place and working well. It will also facilitate the convergence of regulation across Europe, which is a major goal of EIOPA. In all jurisdictions Cronin expects that the emphasis will increasingly be on what she calls the “conduct space” - for example, the embedding of risk management, product oversight and governance, and serving the customer. A green paper on retail distribution, recently announced by Commissioner Hill, will be the next big thing coming at us. Questioned about the current state of the non-life market and concerns about its profitability, Cronin notes that the motor market in particular is highly competitive and is being impacted seriously by the low interest rate environment. Higher claims and legal costs are also expected because of the introduction of PPOs and the Courts and Civil Law (Miscellaneous Provisions) Act 2013. Nevertheless, she sees some evidence of premium rates increasing which is clearly welcome (by the industry, if not by customers). She says the findings of the 2014 EIOPA stress tests, which seemed to indicate that a higher than expected number of Irish companies would have a Solvency II SCR below 100%, is somewhat misleading. The tests were done on a standard formula basis and the internal model basis would in most cases produce a significantly better result, she says. She confirmed however that the Central Bank is working very closely with a number of companies to ensure that their solvency is satisfactory under Solvency II. She expects a small number will still have a problem when this process is complete. On the life side, Cronin notes that the domestic market is doing well and benefitting from a move by customers away from low interest bearing bank deposit accounts. The cross border sector is also growing exceptionally well in its main markets of the UK and Italy. She does not detect much growth in the VA business in the UK and thinks that the growth there is in the unit linked sector. The move to Solvency II will create an “interesting” situation in relation to the treatment of the Italian tax asset. While the recently introduced limitations on how this is treated for Solvency I purposes will fall into abeyance, the Central Bank will expect companies to value the tax asset on the Prudent Person Principle and to give serious consideration to liquidity and concentration risk. Where companies do value it fully the Bank will be looking for evidence that this is appropriate. Preparations for Solvency II are on course and Cronin expects that the implementation at the end of the year will be reasonably smooth if firms maintain the current strong momentum that exists in the Solvency II project. The final Implementing Technical Standards and guidance notes have just been signed off by EIOPA and the preparatory phase QRTS were all submitted successfully within the recent deadline. The next exercise will be to examine the quality of the data submitted. Cronin believes this could be an interesting challenge given the robustness of some of the systems in place. One issue that is exercising some companies is what percentage of the SCR will be deemed satisfactory by the Central Bank, as in the Solvency I regime it was considered necessary to cover at least 150% of the solvency margin. The answer, according to Cronin, is that “it depends”. In this she is perhaps reflecting the scepticism with which the Bank views the SCR, as recently articulated by Deputy Governor Roux. It is here that the Central Bank will be looking closely at the ORSA and its central role in establishing the real capital needs of the company. Clearly Sylvia Cronin has much on her agenda but it was nice to see that she is still smiling. This article appeared in the July 2015 edition.